Seventeen-year-old Lennie Walker is a bookworm and a band geek. She's always lived in the shadow of her older sister, Bailey, but she liked it that way. And then Bailey dies unexpectedly. Lennie is falling apart in the aftermath, and she doesn't know how to handle her overwhelming grief. She's also gone from a nonexistent love life to struggling between two. Toby was Bailey's old boyfriend, and he completely understands Lennie's grief. Joe is the new guy in town, and he's got a magical grin and music in his bones. My favorite part of the Goodreads summary: "For Lennie, they're the sun and the moon; one boy takes her out of her sorrow, and the other comforts her in it. But just like their celestial counterparts, they can't collide without the whole wide world exploding." Lennie has to figure how to live without her sister, and where she fits in to the story of her life. I really love this cover! I love that the title is bold, graphic and takes center stage. It would have been so easy to make this cover totally cheesy, and I will be forever grateful that they didn't. I was proud to carry this book around! Lennie is grieving. She's falling apart. And in her grief, she makes some decisions that really drove me crazy. In fact, I wanted to knock some sense in to her head. But I also wanted to give this book a hug in some parts, as if I could somehow reach Lennie through the pages. Because even when she drove me crazy, my heart still went out to her. I was interested in her journey, and I cared about the outcome. I was grieving for Lennie while she was missing her sister. I was celebrating with her when she found love. It's a great book that makes me care that much about a character's journey. Literary Love: Holy Swoon, Heathcliff & Cathy! Lennie's favorite book is Wuthering Heights. I find that very fitting because when she falls in love, she falls really hard. It's intense, all-consuming and full of passion. Now, did I want to see more of a friendship first? Maybe. But did I pretty much fall for the fella, too? You bet I did. Lennie might have an over the top falling in love experience, but that doesn't mean I didn't enjoy it. When Lennie falls in love, it's like the sky opens and she falls in. It's very Heathcliff and Cathy. I like Wuthering Heights, but I don't love it. I think the love story is kind of creepy and a little too intense for me. Thankfully, I didn't feel that way about the love story in The Sky is Everywhere. However, there was one storyline that I absolutely hated. I kind of understood why Lennie acted a certain way, but I was so ready for her to wise up. Thankfully, she finally did! It's the writing that totally sold me on this book. It's honest, poetic and packs a huge emotional punch. The writing was so good that I loved the book even when I didn't love Lennie. And you know it's a good book when I'm frustrated with the main character but can't put the book down. I really don't think I'm doing the prose justice... so just trust me when I say that this is what takes the book beyond just a "good" read. Lennie pours her heart out on scraps of paper and then releases them into the world. This scattering of her heart was so beautiful, so heartbreaking... it was absolutely one of my favorite parts of the book. Her notes are scattered throughout the novel, and I grew to love "finding" a new note when I'd turn the page. There is a sort of outdoor bedroom hidden away, and I think it sounded so cool. I mean, wouldn't you think it was really interesting if you stumbled upon something like that while walking in the woods? "My sister will die over and over again for the rest of my life. Grief is forever. It doesn't go away; it becomes a part of you, step for step, breath for breath. I will never stop grieving Bailey because I will never stop loving her. That's just how it is. Grief and love are conjoined, you don't get one without the other. All I can do is love her, and love the world, emulate her by living with daring and spirit and joy." I checked this book out from the library, but this is one I want to add to my personal library as soon as possible! While there were a few things Lennie did that bothered me, I understood that she was acting out of grief. And honestly, the writing was so absolutely lovely that it is just calling for a re-read. This book is gorgeous and heartbreaking. This picture of life, love and loss is a book I won't soon forget. "It's a great book that makes me care that much about a character's journey." YES. If you haven't read this yet, you really need to fix that soon. It's SO good! Your review totally makes me want to read this book. You should definitely read this! I really loved the writing. I didn't love every decision the main character made, but I understood the motivation behind the decisions. That, for me, made me really care about the character and enjoy the book. I'll be interested to see what you think if you end up reading it! AND YAY FOR THE STATISTICAL PROBABILITY! That makes me so happy :) It's so cute! I'm SO glad that you wrote so many awesome things about this book! Your love for it definitely convinced me that I needed to check it out, and I'm so glad I did. It was wonderful! I got it from the library, but I want to own a copy now. It's THAT good! I loved this book so much. Even if she didn't do the right thing a lot of the time. I could relate to her recklessness. She was just going with things. I liked the scrap of papers too. That added a fun feel to the book. As fun as a book about this subject could have been. Have you read The Survival Kit? This reminded me of that book as well. 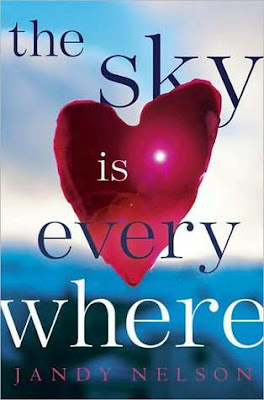 The Sky Is Everywhere is one of those books that I am SO glad I own and can flip to whenever I want to read more about Lennie and Joe and her kickass gram. Sigh. I love seeing when others love this book. I just checked it out from the library, but I'm planning on buying a copy. It's definitely a book that not only deserves to be on my shelf, but I'm also dying to have it there. I loved that you flip through it sometimes - I do that, too, with my favorite books!